​In 1642, the Norfolk Town of King’s Lynn was an important North Sea port. Protected by rivers on two sides, at the outbreak of the English Civil War, the town’s existing, largely medieval, defences were repaired, improved and re-armed. But in the late summer of 1643, following a naval blockade and a siege lasting several weeks, the town was captured by the forces of Parliament who immediately set about improving the town’s fortifications in line with current continental practice. In so doing, creating a system of defence which, in British terms, is quite possibly unique. 375 years on, the visages of King’s Lynn’s civil war still exist. In some places, they can easily be seen, whilst elsewhere they harder to find. But from a conflict archaeology perspective, where a siege leaves a far greater archaeological footprint than any battle, King’s Lynn offers considerable potential. King’s Lynn Under Siege is a long term community-based archaeological research project involving professionals, academics, students, volunteers and local communities that will deploy a full range of techniques and approaches to the understanding of the lived human experience of the English Civil Wars and its impact upon the people and fabric of King’s Lynn. 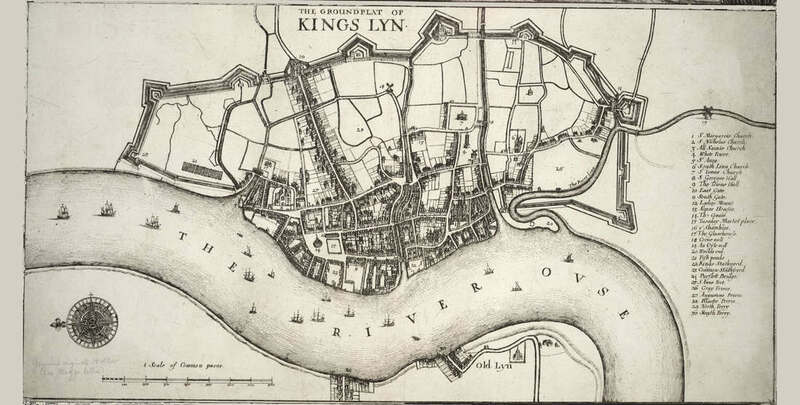 During the English Civil Wars, the Norfolk port of King’s Lynn was fortified, besieged, and then re-fortified. 370 years on, the town is home to King’s Lynn under Siege (KLUS), an archaeological and historical project investigating the experiences of King’s Lynn and its citizens during this turbulent period of British History, and in so doing, establishing King’s Lynn as a centre for English Civil War research. As part of the activities for this year’s King’s Lynn Heritage Open Day, the two co-founders of KLUS will be presenting The Strongest Fortress in East Anglia: revolution and civil war in Kings Lynn, 1640-1660, an illustrated talk which looks at King’s Lynn during the English Civil Wars. Archaeologist and historian Dr. Neil Faulkner will consider King’s Lynn during the Civil War period, and how it featured in a wider, national context; whilst David Flintham, a specialist in 17th century fortress warfare will focus on the town’s fortifications and how the latest European techniques transformed King’s Lynn into the strongest fortress in East Anglia. The talk will take place at 1730 on Saturday, 15 September, 2018 at Marriott’s Warehouse, a Grade II listed building on King’s Lynn’s historic South Quay. This talk is free, although donations to the Marriott’s Warehouse Trust are welcomed.